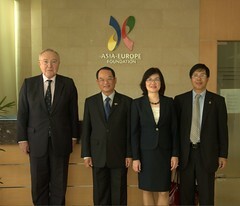 Ms Nguyen Nguyet Nga, Vietnamese Senior Official of the Asia-Europe Meeting (ASEM) (3rd from left) paid a courtesy call on ASEF Executive Director Ambassador Michel Filhol (left) and Deputy Executive Director Nguyen Quoc Khanh (right) at the ASEF office on 10 January 2012. Vietnamese Ambassador to Singapore Ambassador Tran Hai Hau (2nd from left) was also present during the call. Aside from her duties as ASEM Senior Official for Vietnam, Ms Nguyen also serves as the Director General of the Department for Multilateral Economic Cooperation of the Ministry of Foreign Affairs, Vietnam. View more photos of the visit on our Flickr page.